To many people today, the fact that the spinning of the earth leads to a bulge around the equator, seems fairly obvious. It is very much a feature of the human brain, that what we are taught to believe is right, seems obviously right; and what we are taught to believe is wrong, seems obviously wrong. 300 years ago, nobody knew that the earth had an equatorial bulge; so when Newton proposed the idea, it was met with a mixed reception, with some accomplished physicists even insisting that the earth should have a larger polar diameter than equatorial diameter. The shape of the earth is sometimes described as being a bit like a grapefruit, with the spherical axis larger than the elliptical axis; but these scientists were arguing it should be shaped like a lemon, where the spherical axis is smaller. Newton’s logic was of course sound, but that was not enough, and it was only when it was proved by measurement that the idea was generally accepted. Newton imagined the existence of two tunnels, one from the North Pole to the centre of the earth, and the other from the equator to the centre. If these tunnels were joined at the centre, and filled with water, then as the earth began to spin, water would start to flow from the pole towards the equator. A simple way to calculate the size of the bulge, is to use the equation v² /r to work out the effective reduction in the mass of the water in the equatorial tunnel, resulting from the centrifugal force. The speed of a particle on the equator is: 2p ´ 6,378 km (the earth’s radius) per day (actually 23hrs 56 minutes). In metres per second it works out as 465 m/s. If we square that and divide it by the earth’s radius we get a centrifugal force of .0339, which is 1/289 of the force of gravity at the earth’s surface. At the centre of the earth, there is no centrifugal force; and the equation v² /r means that a particle a third of the earth’s radius from the centre, would have a centrifugal force of a third, because it is going round at a third of the speed. So the average centrifugal force over the whole tunnel, is half of 1/289, that is 1/578. A force 1/578 of gravity at the equator, summed up over the full radius of the earth, is sufficient to balance a column of water 1/578 of the earth’s radius situated at the equator. Therefore for the pressure in the two tunnels to balance, the column of water in the equatorial tunnel must be longer by 1/578 of the earth’s radius. This gives us an equatorial bulge, due to centrifugal forces of about 11.035 km. If we compare this with the measured value of 21.36 km, then clearly something is awry. At this point it is customary for physics students to scratch their heads and look for the error in their maths. In fact, that is actually the correct contribution that centrifugal forces make to the bulge; but once the bulge exists, its own gravitational pull makes itself bigger. What is relevant here, is the mass of the bulge relative to the mass of the earth. So if the earth was a solid spherical iron ball which did not distort, and it was covered in water, then the gravitational pull of the ocean bulge would increase the height of the bulge by less than 1 km. However the earth’s core is molten, so in general the rock of which the earth is made, has distorted by an appropriate amount. This means that to do the calculation, we will start by assuming that the density of the bulge is the same as the density of the rest of the earth. Incidentally, if the rock had not distorted to bulge by the appropriate amount, then the whole equator would be flooded; whilst if the rock had somehow frozen in an over-distorted shape then the whole equator would be a mountain range. The idea that an equatorial bulge, on an otherwise spherical earth, would pull water towards itself, should be fairly clear. However what is not so obvious is how to calculate the effect, so to illustrate the method, I will begin by making a very rough approximation. To work out the mass of the bulge, we need to calculate its volume. To do this we actually need to know how high it is, so to make things simple we will start with the measured value of roughly 21 km, which is about 1/300 of the earth’s radius. If we were to add a thickness of 1/300 over the whole surface of the earth, that would increase its volume by about 3/300. However we are adding nothing at the poles; so taking account the elliptical shape of the bulge, we will assume that it would have a mass 2/300 of the rest of the earth. In order to make the initial calculation relatively simple, we will assume that all the mass of the bulge is contained in a single dense ring around the equator; though this will inevitably lead to a gross over-estimate of its gravitational pull. To do the calculations effectively, we need to use the idea that water (or rock) will flow from the poles to the equator until there is exactly zero energy to be gained from making the trip; a theory known as equi-potententials. So rather than using gravitational forces, we need to use gravitational potentials. If a particle moves from infinity to a distance 4 from the earth, it will gain an energy of ¼, from infinity to a distance 2 gains an energy of ½, and from infinity to a distance 1 an energy of 1. This 1/r formula means we can work out the amount of energy a particle gains from approaching the dense ring around the equator. If the particle drops down the polar tunnel, then when it reaches the centre it will be a distance R from every part of the ring. So the energy gained from the ring will be (1- 1/Ö2)R, or about 0.29R, times the mass of the ring, which is 2/300 the mass of the earth. Therefore the energy gained from the trip to the centre, is sufficient to increase the height of the water at the equator by 0.58/300 times the earth’s radius, which is about 12.3 km. If we add this to the 11.035 km bulge caused by the centrifugal force, we are already above our required value of 22 km. However as mentioned, assuming that all the mass of the bulge is contained in a single ring around the equator, does lead to a substantial over-estimate, which will be corrected later. The ring also exerts a gravitational force on the water in the equatorial tunnel; 0 at the centre of the earth where everything is symmetric, but increasing towards the equator. It is not really practical to try to calculate this directly; so I will turn the problem on its head, and instead of modelling the earth as a sphere with an equatorial bulge, I will model it as a bigger sphere which is missing a large chunk at each pole. Since the bulge has a mass of 2/300 of the earth, the chunks must have a combined mass of -1/300 in order to add up to 3/300, and give an even depth of 1/300 all over the earth. To simplify the calculation, I will assume that half the total missing mass is located exactly on the North Pole, and half on the South Pole. (Equally we could have assumed that there was a missing band running around the circumference from pole to pole.) Since the chunks are an absence of mass, they will effectively produce anti-gravity which pushes the water up the tunnel towards the equator. The energy released is of course the same as above, except that the absence of mass this time is -1/300 instead of 2/300, so this should increase the bulge by a further 6.1 km. Again by putting all the mass at the poles, instead of spreading it out, we have got a gross over-estimate. Correcting the over-estimate in the polar tunnel, is not too difficult, because all we need to do is turn the equatorial bulge into a series of rings, work out the energy released by each ring, and then add the separate contributions of all the rings together. The first stage in that process, is to find out the shape of the bulge. It would be convenient to know exactly what shape the earth has, but since I do not, I will instead assume it to be the shape it would be if the whole bulge was accounted for by centrifugal forces. This is fairly logical, because the bigger each part of the bulge, the more they should attract matter towards themselves. To avoid drilling tunnels all over the earth, I will instead derive a formula for the height of the water, based on the conservation of angular momentum and the conservation of energy. This equation tells us the speed of rotation of the earth [w (2)] once the water drop has moved to the equator; in terms of the original speed of rotation w , the mass of the drop m, the radius of the earth R, and the moment of inertia of the earth I. ½[w (1-mR² /I)]² times I+mR² . I have chosen to call the radius of the earth 1. Obviously the bulge is greatly exaggerated, and some of the approximations I am using would not work if the bulge was substantially greater than 1/300 of the earth’s radius. 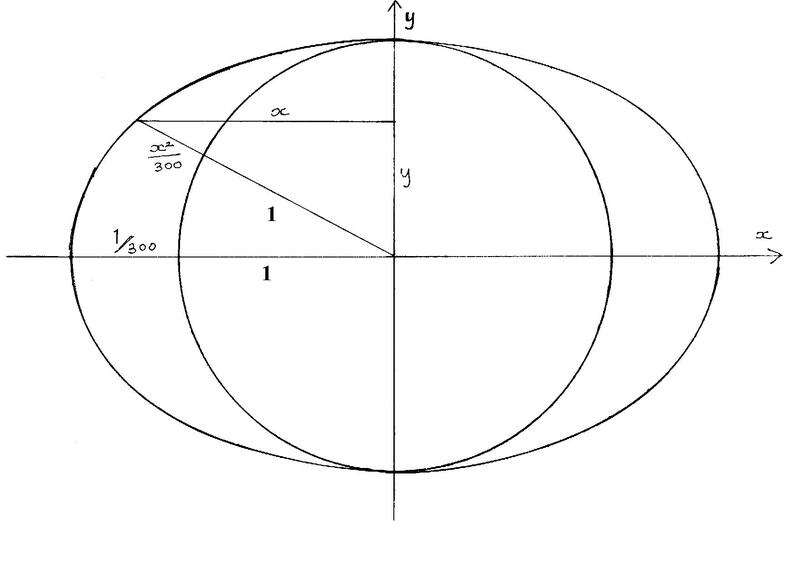 From the above diagram we can deduce, that the now elliptical earth is described by the approximate equation: x=Ö (1-y² ) ´ 301/300; which means that the x value of the bulge will be Ö (1-y² ) ´ 1/300. We could now cut the bulge into a number of slices, work out the energy gain/loss from each slice, and add them all together; but it also possible to take infinitely small slices, and integrate the expression. The expression that we need to integrate is therefore: (1-y² )[1-1/Ö (2-2y)], which comes out as: -1/15(y-1)(5y² + (3Ö (2-2y) + 5)y + 7Ö (2-2y) -10). 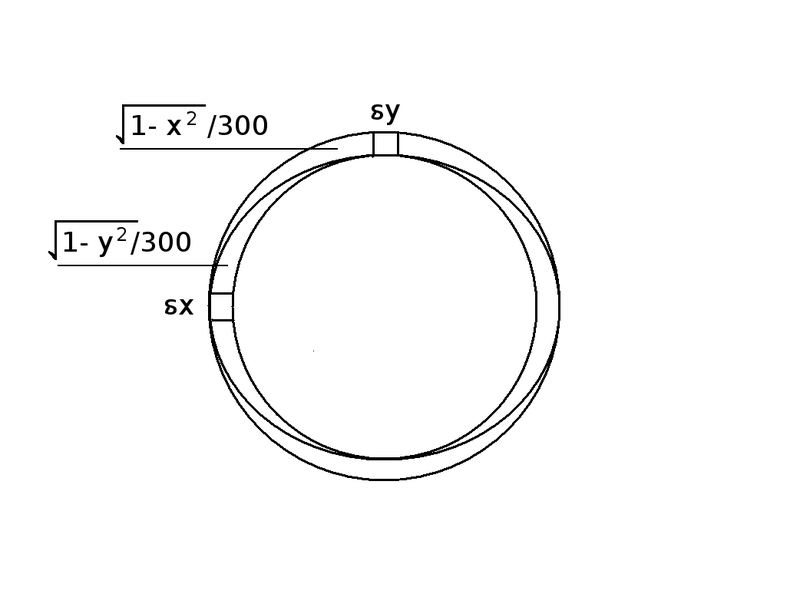 We need the sum of all the rings between y =1 and y = -1, which works out as 4/15, and multiply by 2p /300. This gives us the total energy released, but not in the normal units of energy, rather in the units where the volume (mass) and radius of the earth are taken to be 1. We could convert the units, but that is unnecessary, as all we actually need to do is divide by the mass of the earth (4/3p ), to give us the height of bulge as a fraction of the earth’s diameter: 1/750. If we multiply this by the diameter of the earth, we get 8.505 km. To accurately calculate the anti-gravitational push of the missing chunks at the poles, we need to do a similar integration as we did for the bulge. If you look at the diagram below, you will see that in two dimensions the missing chunks have almost the shape as the bulge, and are described by similar equations with x replaced by y. However in three dimensions the situation is not symmetrical. 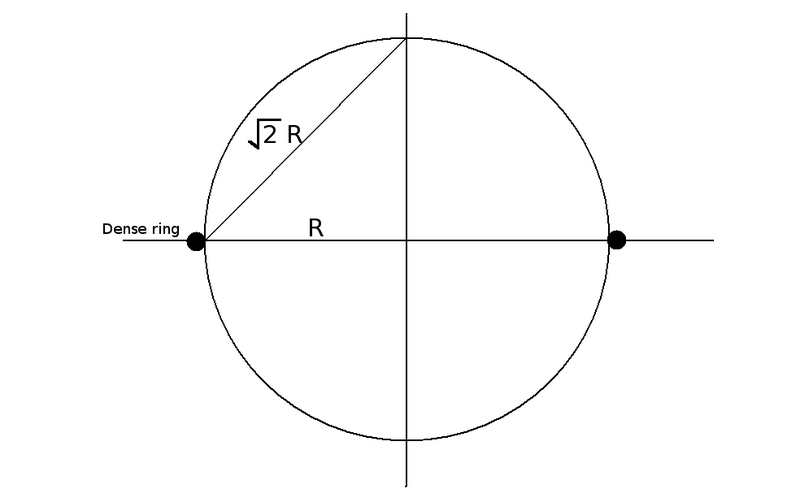 When we rotate d y about the equator, it produces a ring of uniform thickness; whilst when we rotate d x from pole to pole, the ring fades to nothing at the equator. Hence the integral of the missing chunks turns out to be exactly half the integral of the bulge. So we need to multiply 8.505 by 3/2 to give us a total gravitational effect of 12.758 km. That however is not a valid calculation, because we have assumed the bulge to be 1/300 but calculated it to be 11.035 + 12.758 divided by 6,378, which is actually 1/268. Instead we need to solve the equation: 11.035 + (4/15 ´ 9/4 ´ Width) = Width, to give us a total bulge width at the equator of 27.59 km, or 17.24 miles. That is an interesting answer, not just because it is substantially higher than the measured value of 21.36 km, but because it is almost exactly the same as the value Newton calculated in the Principia. Actually Newton’s value was 17.1 miles, but his estimate of the earth’s radius was too low by just over 1%, so the two values are in fact identical. You are probably wondering how the two greatest scientific minds, could both arrive at the same wrong answer, by two very different methods. The reason is, that we both made the same wrong assumption, that the mass of the earth is uniformly distributed. Actually the core of the earth is much denser than the crust, and below I make an adjustment for that. First I will come up with a general equation for describing the height (width) of the equatorial bulge of a planet of uniform density (at the equator the height and the width of the bulge are the same thing, but elsewhere they are not). The equation derived above boils down to saying that the true height of the bulge = 2½ times the height calculated on the basis of centrifugal force alone. The height based on centrifugal force alone = ½ v² divided by the force of gravity at the surface. ½ v² can be rewritten as ½ (2p w )² R² ; the force of gravity is 4/3 p R³ r G/ R² where r is the density of the planet and G the gravitational constant. With a bit of algebra, we come up with the final expression for the height of the bulge as 15/4 p w ² R/r G.
An interesting thing to note is that the height of the equatorial bulge expressed as a fraction of the radius, does not depend on the size of the planet, but only on its density and rate of rotation. The reason I have expressed it in this form, is that a similar expression has now appeared on Wikipedia. I derived the formula myself, because my online research suggested that nobody had a satisfactory method of calculating the height of the bulge. About a week after publishing my page, the Wikipedia page for ‘equatorial bulge’ was edited to include this new expression. Actually the formula is not that useful for calculating the sizes of planetary bulges, because the denser matter always tends to sink to the middle of a planet, so the size of the bulge is less than predicted by the formula. The earth’s actual mass distribution is complicated, but we can get some idea of the way the calculation is distorted, by assuming that the central 1/8 by volume, up to a radius of ½, is actually 3 times as dense as the crust. So the total mass of the earth can be described by the equation 7d/8 + 3d/8, where d is the density of the crust. This means that the actual density of the equatorial bulge is only 0.8 times the earth’s average density. Therefore we must amend our equation to 11.035 + 0.8(4/15 ´ 9/4 ´ Width) = Width, which gives the value of 21.22 km. That is all very well, except that we now need to take into account the fact that the dense central core will also have a bulge, as it is also revolving once a day. This core-bulge will exert a gravitational force on the equatorial bulge, which will tend to increase its size. Logically we might perhaps start by calculating the size of the core-bulge; but the calculations are quite long, so I will leave them to the end, and instead start by working out the effect of the core-bulge on the final answer. 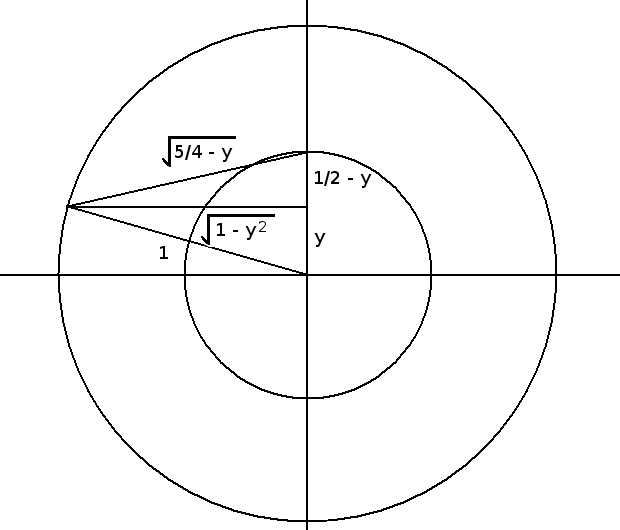 The integral of (¼ – y² )(2 – (1/Ö (1¼ -2 y)) is: 1/3840 [-2560y³ – 384 Ö (5-8y)y² – 320(Ö (5-8y)- 6)y + 80Ö (5-8y)]. Integrated between ½ and -½, it gives a value of 7/40. The size of the core-bulge is represented by the (¼ – y² ) part of the integral; the length of each ring being Ö (¼ – y² ) ´ 2p , and the width of each ring being Ö (¼ – y² ) ´ twice the maximum core-bulge width (c-bw). So we need to multiply 7/40 by 2p times 2c-bw, then divide by the volume of the earth (4/3 p ). We then need to multiply this by 3/2, to take account of the anti-gravitational push of the missing core-chunks, to give an answer of 63/80 c-bw. However that is not a complete answer, because although it correctly predicts the energy gain from a particle going down the polar tunnel, and it works okay for the particle going up the first half of the equatorial tunnel, the last stage of the journey is different. This time as it moves away from the core-bulge, it will actually lose more energy than if the mass of the core bulge was distributed spherically. Modelling the earth as a larger sphere with missing chunks, worked fine because the particle was always inside the sphere; that is because a spherical shell of uniform density exerts no gravitational force on a particle inside it. However once outside the core, we do need to take account of the extra mass of the extra shell that forms part of the larger core-sphere. The extra volume of the larger core-sphere is 3c-bw times ¼, since the radius of the whole earth is taken as 1. As a particle leaves the core, it moves from a distance ½ to a distance 1, from the centre of the extra core-shell (also of course the centre of the earth). So the energy lost will be ¾ c-bw. We now deduct ¾ c-bw from 63/80 c-bw, to give us a gain of 3/80 c-bw. This value of 3/80 c-bw is based solely on volume, so we now need to take account of its density. The density of the core is 2.4 times the average density of the earth, however if it was the average density it would have no effect. So I assume I should deduct 1 from 2.4, and give the core-bulge an effective density of 1.4. Multiplying 3/80 c-bw by 1.4, gives us 21/400 c-bw. 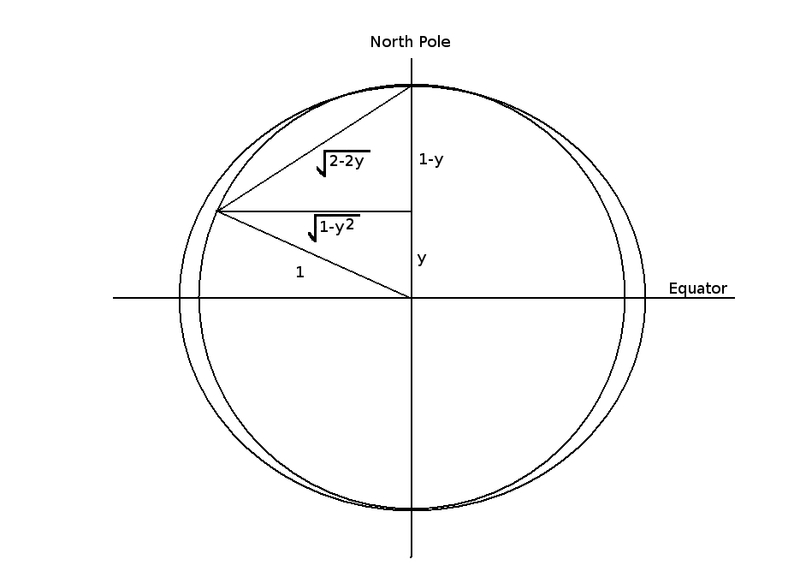 To complete the calculation, and find the energy gained by a particle moving from the North Pole to the equator under the influence of the core-bulge, we need to use the value of the core-bulge width which is calculated later, that is 1/687 of the earth’s radius. 21/400 times 1/687 = 1/13086. This needs to be added to the equatorial bulge of 1/578 caused by centrifugal forces alone, to give us 1/554. So we have a final equation of: 1/554 + 0.8(4/15 ´ 9/4 ´ Width) = Width, which solves to give us 1/288 times 6378 = 22.16 km. To get the measured value of 21.36, it would be necessary to assume that the central 1/8 of the earth by volume is actually nearly 3½ times as dense as the remaining crust. This graph of the estimated density of various parts of the earth, does not seem to support that assumption. It could be that my maths is wrong, or it could be that the core of the earth is really denser than geophysicists actually think, or possibly both. Maybe the huge pressure very near the centre compresses atoms together in a way not currently understood, such that metals are many times denser than expected. With the average density of the earth being about 5½ times that of water, and the crust near the surface being only about 3 times as dense as water, there is certainly plenty of scope for the necessary variation. Here is Newton’s calculation in the Principia. I do not understand what he has done, so if you can figure it out please leave a comment. The problem for Newton was that at the time nobody knew much maths, because Newton himself had only just invented it; so even if Newton had used the same method as me, it would still have been incomprehensible to his contemporaries. If you are a glutton for maths, you can read on and see how I calculated the size of the core-bulge. Otherwise you could look at the theory of everything described on elsewhere on this blog. A simple way to calculate the size of the core-bulge, is by comparing it to the equatorial bulge. Since the speed of a particle at radius ½ is v/2, the width would be reduced by ¼; but we also need to take account of the fact that the mass of the central core is 3/10 the mass of the whole earth, and that we are now at a distance of ½ from the centre. So the centrifugal component of the core-bulge will be: ¼ ´ ¼ ´ 10/3 = 5/24 times the centrifugal component of the equatorial bulge. That is 5/24 times 11.035/6378 = 1/2774 of the earth’s radius. 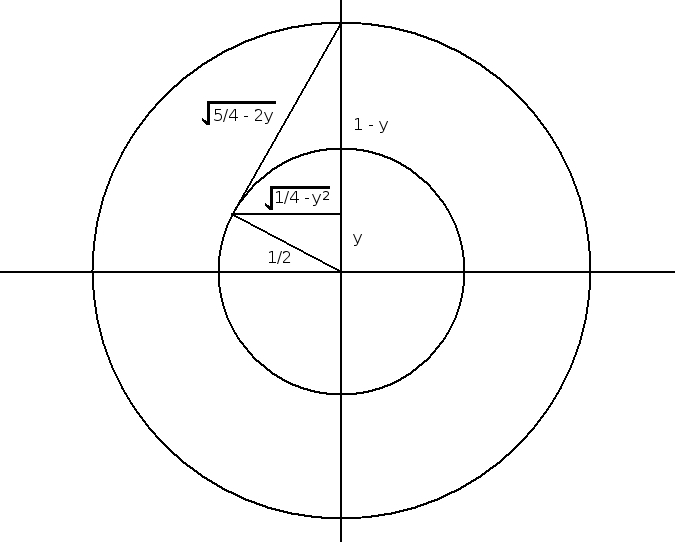 The integral of (1-y² )(1-1/Ö (5/4 – y) is: y² (0.4 Ö (5/4 – y)) + y(1 – (2/3)Ö (5/4 – y)) + (1/3) Ö (5/4 – y) – (1/3)y³ . Putting 1 into the formula we get 0.3, from this we need to deduct the 0.2333 value for -1, to give 0.07667. Taking into account both tunnels, and the fact the equatorial bulge is only 0.8 times the average density of the earth, we end up with an energy value of: 3/2 ´ 0.8(2p ´ 0.07667) times the width of the equatorial bulge. This needs to be divided by the mass of the earth ((4/3)p , but we also need to make an adjustment for the gravitational force on the surface of the core, which involves multiplying by 10/3 due to the mass of the core, and multiplying by ¼ due to the distance from the centre. This gives a value of .115 times the width of the equatorial bulge. But it would not be logical to use the actual value of 1/300, because the water needs to surround the core symmetrically in order not to exert any net force, so it would probably be a reasonable approximation to use a value of 1/300 minus the width of the core-bulge (c-bw). Therefore the extra width of the core bulge, as a result of the gravity of the equatorial bulge is 0.115(1/300 – c-bw) times the earth’s radius. The integral of (¼ – y² )(2 – (1/Ö (½ – y)) is: 1/60 (1-2y)³ /² ´ (-10y Ö (1-2y) + 6y Ö 2 – 10 Ö (1-2y) + 7 Ö 2). Integrating between ½ and -½ , gives the value: 0.06667. So we get an energy value of 3/2 ´ 2.4(2p ´ 0.06667) times twice the maximum width of final the core-bulge. This needs to be divided by the mass of the earth ((4/3)p , but again we need to make an adjustment for the gravitational force on the surface of the core, which involves multiplying by 10/3 due to the mass of the core, and multiplying by ¼ due to the distance from the centre. This gives us the equation 1/1334 – 0.115 c-bw + .6 c-bw = c-bw, leading to a final maximum width of the core-bulge of 1/687 of the earth’s radius. Since Jupiter has irregular features on its surface, the fact that is spins, was presumably noticed soon after the invention of the telescope in 1608. With an equatorial diameter greater by about 1/15 than the polar diameter, its elliptical shape should also have been soon apparent; certainly in the Principia Newton refers to measurements of this. It was of course Newton who had the imagination to correlate the two things, and realise that the elliptical profile resulted from the planet’s rotation. The size of an equatorial bulge depends on the inverse of a planet’s density, and the square of its rotation speed. The average density of the earth is 4.15 times as great as that of Jupiter. Also Jupiter rotates once in 9.9 hours. (24/9.9)² = 5.87, multiply that by 4.15 = 24.4. Therefore Jupiter should have a bulge 24.4 times that of the earth. The earth’s bulge based on centrifugal force alone is 1/578. 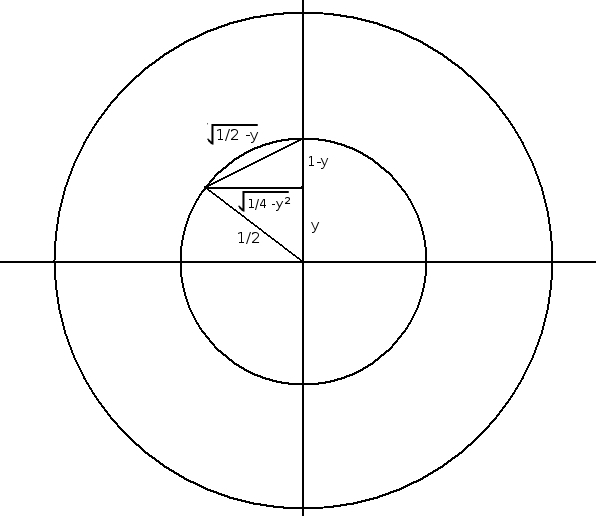 So if all the mass of Jupiter were situated at the centre, and the surface had negligible mass, then Jupiter’s bulge would be 24.4/578 = 1/24 of its radius. The earth’s bulge if its mass was uniformly distributed would be 1/230; so if Jupiter’s mass was uniformly distributed then its bulge would be 24.4/230 = 1/9.4. The earth’s actual bulge is close to 1/300, so if Jupiter had a similar mass distribution to the earth, it would have a bulge of 24.4/300 = 1/12.3. Since Jupiter’s actual bulge is 1/15, we must conclude that on average much more of Jupiter’s mass is situated close to the centre than is the case for the earth. Using the equation: bulge due to centrifugal forces alone + surface density (3/5 bulge) = bulge, we get 1/24 + surface density (3/5 times 1/15) = 1/15, which solves to give a surface density of 45/72 that of the average density. Since Jupiter’s average density is 1.33, the surface density would be about 0.83 that of water; assuming that all the upper crust of Jupiter is of uniform density, and that the remaining dense core of the planet is situated very close to the centre, things which are probably not even approximately true. 14 Responses to The earth’s equatorial bulge. I’m a little confused. I was just watching a National Geographic doc about what would happen if the earth stopped rotating. One consequence was that the oceans would flow to the poles and flood the extreme northern and southern regions. This had something to do with the reduction of the equatorial bulge. However, it seems to me (I claim no physics expertise) that, as the rotation decreased, the equatorial bulge would decrease, and the northern and southern declivities would increase, i.e. the earth would become more spherical. In this case, wouldn’t the distribution of water be equalized over the globe resulting in an actual increase in the level of water nearer the equator? BTW, when I was in 8th grade, we were taught that “scientists” had discovered that the earth was shaped like an egg, with a greater bulge in the southern hemisphere. So much for discovery. I think what you say is correct. In the past the earth span much faster, like a 17 hr day, and it appears from the fact that the equator is not currently a solid bulge many miles above sea-level, that the bulge in the earth and in the ocean have subsided at a similar rate. Maybe the doc was wrong, or perhaps they were just trying to say what would happen if the solid earth remained frozen in its current state and only the water was free to relocate. I think the egginess is only a matter of a few metres, so is trivial compared to the 21 km bulge. I know this is old but I thought I should answer it. The issue is one of time scale. Water is a liquid and flows quite freely. The more “solid” and molten parts of Earth flow a lot more slowly (compare water and honey for an example, but Earth flows a lot slower). This means the water will rapidly flood the polar regions, leaving the equator dry. However over time the solid and molten parts of Earth will flow and become more spherical, establishing a water level similar to what you expect. could the gradual changing, down through time, in the bulge in the earth have effected the time period that it takes for the moon to rotate the earth? The rotation of the earth is being slowed by the orbiting moon, so by an ‘equal and opposite force’ argument, the rotation of the earth must affect the orbit of the moon. As the earth’s rotation slows, the earth will become more spherical, meaning water and rock will flow from the equator in the direction of the poles. By the conservation of momentum, as the matter moves it will try to speed up the earth’s rotation. Therefore there will be a link as you say, but probably not a great link and not too easy to calculate. I am currently immersed in trying to figure out how a battery works, so sorry for not providing a fuller answer, but I hope that helps. Is there any experiment that has actually measured this bulge? I think it was first measured in the late 18th century. Nowadays I would guess it can measured very accurately from the GPS system. the bulge at the equator results from the rotation or revolution or orbit of the earth ? It is the result of the fact that the earth rotates about its own centre. I’ve read about the “geomagnetic pole shift/reversal” (its happened before in history and is happening again), that could change earth’s axis and the location of the equator. I’ve also read, from questionable source, that the sea-level is estimated to be about 400′ higher at equator than in UK where “sea-level” is measured. – Is +400′ of sea-level height accurate at equator vs. sea-level measurement i.e., in the UK? – If geomagnetic polar shift changes locations of the poles and the equator–would the sea-level height cover lands along new equator and expose lands along the existing equator, at +/- 400′ difference? The magnetic field of the earth is believed to be a result of the earth’s rotation, but the flipping of the poles would not affect the bulge. The sea level at the equator is 23 km higher than if the earth was a perfect sphere, because the earth’s rotation turns it elliptical. I do not know what the 400′ you refer to means. I read that the pear-shaped bulge is about 1 km on the radius in the southern hemisphere. I do not know what causes it, but it could be due to a variation in the density of the earth. That’s interesting, I wonder why the amount is so small, seems negligible given the scale. Struggling to comprehend how density affects the oceans to any degree though. I’m yet to find the official numbers, would love to see officially to what degree and why this occurs.